Every year I use the same method to cook my turkey. 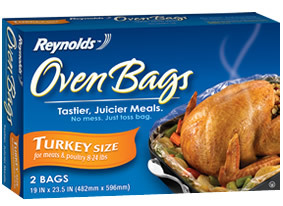 The spices, rubs and things stuffed inside may change from year to year, but I've always relied on Reynolds Oven Bags... Turkey Edition. Last year, I blended room temperature butter, pressed garlic cloves, fresh minced herbs like sage, parsley, rosemary and thyme, plus lemon zest, salt and lots of black pepper to make a paste to rub over the skin before roasting. The inside of the bird was filled with an onion, whole garlic cloves, the zested lemon, salt, pepper and whole branches of the same herbs. Close up the oven bag, place it in a roasting pan and follow the cooking instructions enclosed. The turkey comes out golden brown and juicy. 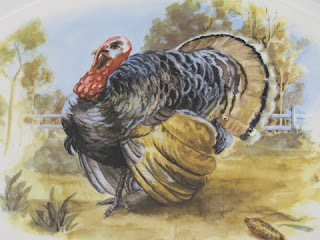 Let your bird rest for 20- 30 minutes out of the oven, then open, remove and carve. Be sure to reserve liquid in bag for that delicious gravy you're planning to make. Don't have a gravy recipe? You can use mine. Click here to see it. This looks great, Susan! Have a wonderful Thanksgiving with your family! !